Mr. Mailbag is back from his summer vacation and is looking to answer any and all questions you may have. This week, the questions ranged from retired number chatter, an inevitable question about practice shorts, the “quarterback race,” and some squirrel chat. Would you be in favor of un-retiring all the retired numbers Auburn has and using a policy like Michigan? The coaches at Michigan choose players to wear the formerly retired numbers and there’s a patch on the jersey commemorating the former player. It seems like a better way to commemorate the former player AND it makes it an honor to wear the jersey for the current player. I think it’s a good idea. I’m not exactly sure what Michigan’s protocol for retiring numbers is, but I’d say it’s probably a little less strict than Auburn’s. 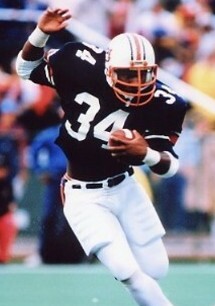 Officially, only three numbers have been retired at Auburn (#7 – Pat Sullivan, #88 – Terry Beasley, #34 -Bo Jackson), and we know Cam’s #2 is coming next given that nobody has worn the number since he left. Michigan was most likely in the spot that they had so many numbers retired that they would run out of real numbers to wear, so they had to get back to letting current players wear them. I do like the idea of handing out a formerly retired or honored number to certain players that should be capable of continuing the legacy, but I just don’t see Auburn needing to do that. I know some hot shot coming out of high school thinks he could come in and be the next Bo Jackson or Cam Newton, but we know the chances of that are almost zero, so why chance defaming the number? On the other hand, if you waited until a team captain’s senior year, I wouldn’t see him wanting to change numbers in his final season at the school. So, it sounds like a fine idea for Michigan, but I like how Auburn does it now. They reserve honoring numbers for Heisman winners, or in Beasley’s case, an integral part of a fellow team member’s Heisman win. So, what is the story with the practice shorts, really? I haven’t been able to get any official word on the reasoning behind the pants, but I think it’s fairly obvious now. The sole purpose is just to have shorts that are out of the way, and are more like game pants. In fact, they are literally cut off game pants from the 2011 season. Maybe it started as an attempt to destroy any and every thing from last year that ended up looking like a good idea to Chizik. Either way, the world can make of them all they want right now, but I bet you that every team in the nation will be doing it in five years. No question. Is the quarterback race really as close as Chizik says it is? When can we expect a decision? No, and it never is. Unless something major changes, Kiehl Frazier will be the starter. The only reason he did not take over in the second half of the season last year was because of his inexperience. We know he is the future and we know the future is now. In fact, I have been told that Frazier and the team has known this since A-Day. If you follow certain players and see what they say to him, you would see that the team knows it as well. It just hasn’t been publicly announced. And it really shouldn’t or doesn’t have to be. As long as the team knows who their leader is, that’s all that matters. Plus, why would you want to give Clemson a chance to prepare for one guy through the entire summer and fall camps? I know it’s frustrating to have no answers regarding the quarterback race almost every single year, but it really doesn’t matter who the quarterback is, or at least when the announcement is, until the first game. So just calm down, ok? Has there ever been talk of Onterrio McCalebb playing in the slot as a receiver? He is so fast and to get him the ball in space would give other teams’ nightmares. Plus it seems like his best shot to get to the NFL. In a way, he’s already sort of been there. Coming out of the backfield, McCallebb was the 2nd-leading receiver in terms of yards last year. Aside from taking a sweep around the outside, that’s where I think he benefits the most. In terms of the NFL, I think he could definitely stick to what he’s doing now. He’s not going to be a between the tackles guy. He’s all about the misdirection, around the end, screen pass skillset. The biggest problem with him in the NFL will be his weight. He has been knocked out (literally) multiple times in his career due to just a normal college hit. Imagine what Ray Lewis would do to him. There’s a reason he steps out of bounds after a big gain rather than taking a hit and trying to get one or two more yards. Regardless, some NFL teams will love to have him because of his speed. He may just be a returned a speed sweep guy, but somebody will want him. Thanks to those that sent in questions this week. If you would like a question answered in a future mailbag, send it in. Why has Holland not taken the reins at MLB? Coach BVG says he (the LBs) has not grasped the mental aspect, and their failure to do so makes me very nervous. Do you think BVG is just pushing him harder through media?